Product information "Qubino Flush 1 Relay with Energy Meter (1*2,3 kW)"
With the Qubino Flush Relay, existing electrical installations (e.g. lighting, airing systems…) can be integrated into a Z-Wave network. Thus, the connected device can still be controlled with the existing wall switch, but – thanks to Z-Wave – also via remote control, smartphone or sensor-controlled automation. The currently thinnest Z-Wave radio module is placed in a wall box right behind the normal switch. The switch is no longer directly connected to the load but acts as input device for the Qubino insert that is controlling the load. The switch only sends control signal to the insert which controls the load then again. The Qubino Flush Relay works with all switch design. You can use a momentary or a toggle switch. It’s recommended to use wall boxes with 65mm depth. But smaller boxes with only 45mm depth can be used also if there is enough space behind the switch. The available space depends on the size of the traditional switch, the dimensions of the wall box and the amount of additional cabling placed in this box. 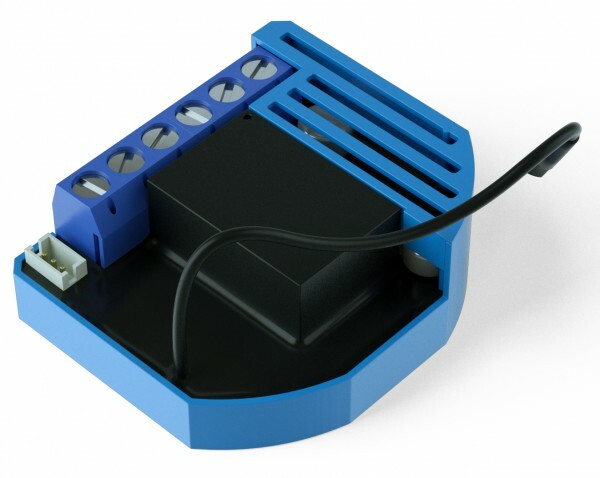 The integrated energy consumption measurement function provides how much energy the connected device use. So you can identify the energy eater in your Smart Home. Related links to "Qubino Flush 1 Relay with Energy Meter (1*2,3 kW)"
POPE011801 v2.3.4 1.1 fully compatible Association must be reset after inclusion. POPE011801 2.3.6 1.1 fully compatible Association must be reset after inclusion. ZMEERAZ 2.3.6 1.1 fully compatible Association must be reset after inclusion. ZMEERAZ v2.3.4 1.1 fully compatible Association must be reset after inclusion. ZMEEUZBWAY 2.3.6 1.1 fully compatible Association must be reset after inclusion. ZMEEUZBWAY v2.3.4 1.1 fully compatible Association must be reset after inclusion. ZMEEUZBWD 2.3.6 1.1 fully compatible Association must be reset after inclusion. ZMEEUZBWD v2.3.4 1.1 fully compatible Association must be reset after inclusion. ZMEERAZ2 2.3.6 1.1 fully compatible Association must be reset after inclusion. ZMEERAZ2 v2.3.4 1.1 fully compatible Association must be reset after inclusion. ZMEEUZB1 v2.3.4 1.1 fully compatible Association must be reset after inclusion. ZMEEUZB1 2.3.6 1.1 fully compatible Association must be reset after inclusion.